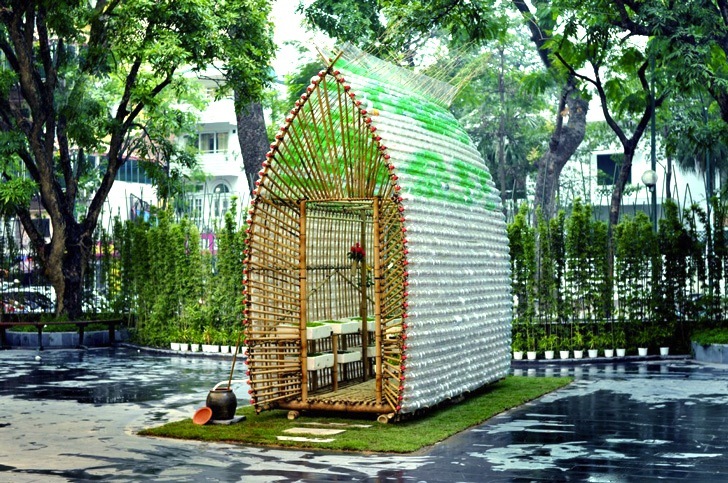 To help promote green living habits in Vietnam, the 1+1>2 International Architecture Company partnered with Action for the City to create a Vegetable Nursery Home made from bamboo and over 2,000 plastic bottles. Apart from its function as a greenhouse, the structure is also a place for farmers to rest away from the rice fields, and a place where children can play and learn about their local ecosystem. The project is also part of a unique collaboration between the governments of Vietnam and Ireland to better support local citizens in the South East Asian country. The vegetable nursery home was on display at the Museum of Women from 21 November, 2013 to 24 December, 2013, and has since been transported to Soc Son organic vegetable farm, where it used in active production. Cool idea but doesn't plastic get destroyed by UV light from the sun? I wonder how long such a structure would last. A cute little structure. But the gaps between mean it's not even mostly waterproof,a basic requirement for a shelter. Worse, there's no way the builders of this gathered 2000 identical bottles to build this; they bought them from a dealer. So this is the opposite of "green." It is nice, portable, light, irrigation system from roof is plus but small. 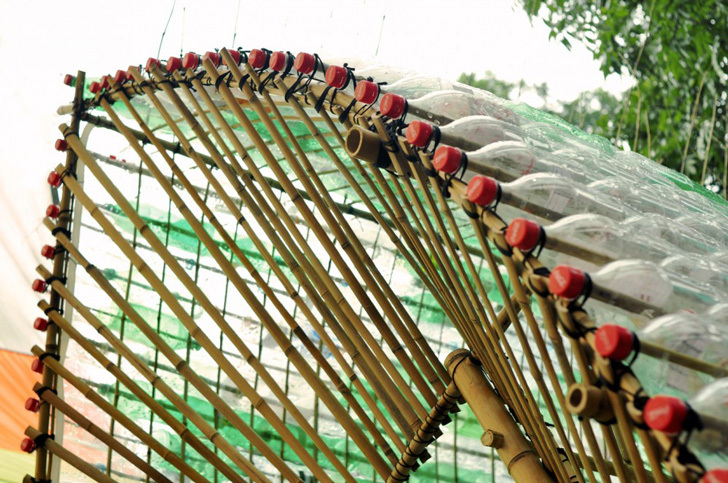 The bottles used to complete the structure, all of which were donated by students and the local community, help to regulate sunlight and control the temperature within the nursery. A water inlet tray on the roof assists with irrigation, and thanks to its lightweight construction, the building can be moved to other areas as cultivation demands dictate. Architects for the project state that it is an example of cooperation between rural inhabitants and urban residents, as well as an "example of researching, [and] applying recycled materials in construction which could be disseminated to other models." The vegetable nursery home was also part of a collaboration between Irish and Vietnamese governments. It was on display at the Museum of Women from 21 November, 2013 to 24 December, 2013, and has since been transported to Soc Son organic vegetable farm, where it is used in active production. Cross-section shows the various plants and materials that can be stored inside the nursery.